Only in America - the most powerful democracy on earth, home to the best and worst of everything - are the most extreme contradictions possible. 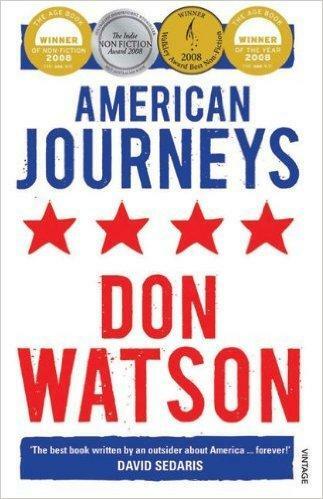 In a series of journeys, acclaimed author Don Watson set out to explore the nation that has influenced him more than any other. Watson’s experiences are profoundly affecting: he witnesses the terrible aftermath of Hurricane; explores the savage history of the Deep South, the heartland of the Civil War; and journeys to the remarkable wilderness of Yellowstone National Park. Yet it is through the people he meets that Watson discovers the incomparable genius of America, its optimism, sophistication and riches - and also its darker side, its disavowal of failure and uncertainty. American Journeys is a very, very fine book. In 2005, Watson spent almost six months on and off criss-crossing America, across the Amtrak tracks and its roads and highways. Watson’s America is not the America of Hollywood or The New York Review of Books, but the America where Matt Austin, who rides bulls, thanks the Lord each time he gets on and drops to his knees to praise the Lord when he survives. It’s the land of microwave bagel and cream cheese or the Whataburger. It’s a land of contradictions; a scientific powerhouse where the advocates of Intelligent Design are actually taken seriously. Watson starts his trip in New Orleans, six months after Hurricane Katrina, a black working-class city devastated and left to rot by government ineptitude a symbol of an incipient racism. Watson is the inveterate sticky beak, eavesdropping on conversations, observing, asking questions of the ordinary people that he encounters. America was where Timothy McVeigh detonated a bomb under a government building, killing 168 people and injuring 800 to ‘put a check on government abuse of power’. At a truck stop, Watson meets a chap who, for $500, helps truck drivers bypass the device that limits their speed. For many of us America is in our imagination; a subliminal message that we can’t escape from. As Watson drives into Oklahoma, the words on the songs start sweeping into his head, and the refrain of Oh What a Beautiful Morning sounds around him. Why, Watson wonders, did the songs and images first heard as a child stick in his mind and come flooding back so easily? The same happens in San Antonio, home to the Alamo, ageing back to the childhood of Davy Crockett, king of the wild frontier. Watson’s experiences of America speak to all of us. Yet, these familiar and strangely comforting images sit awkwardly against the encounter in a diner in Mississippi, where Watson overhears an old black man telling his younger companion about'the plan that the Lord has for us', speaking in the manner in which we might talk about an impending holiday or our superannuation; after a while a young waitress animatedly joins in the discussion. Watson shows us that America definitely is another country. As I said before, this is a very, very fine book. Do yourself a favour - read it … better still, buy it!